When leaving a message, please include e-mail, cell, and landline for a speedy reply and necessary info. 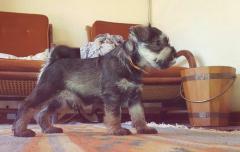 Our puppies are KUSA registered, inoculated, dewormed, Micro chipped, Vet certificate and house training has started. We have been breeding beautiful, confident, well balanced bundles of joy for many years. Pups are reared with much love and care on a farm, and are well socialised with children, family, and other dogs. Delivery can be arranged. Enquiries welcome. 1. Above: Arnold at show - isn't he gorgeous! Owner Lyn Picot. Bred by Lynville. Photographer Reinette van Reenen 2. 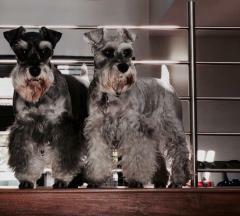 Above: Jacqui Dreyer's 5 dogs, two of them from Lynville. Thank you for three wonderful dogs. We feel privileged to own them. They're loving and cute. I love Nonnie, and Hudson's perfect for me. Sam is in love with Griffin. You chose well! Our vet loves them too and says they're good and relaxed. Max is the sweetest little guy: beautiful, loving nature, but attitude as well! We adore him. Molly is a sweetheart, Oliver a darling. The vet was super-impressed with them and said, "They're beautiful, and well bred." 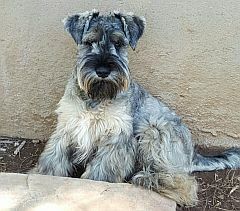 I am a fan of Lyn and her mini schnauzers, and am privileged to enjoy the companionship of three of these precious creatures. 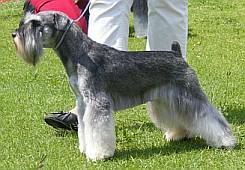 (Gucci and Bentley pictured) Not only do they conform to the breed standard, they are also beautiful, intelligent, and affectionate. 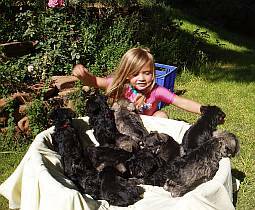 As puppies, my dogs arrived very healthy, secure, and well-socialised, thanks to the excellent care lavished on them by Lyn. 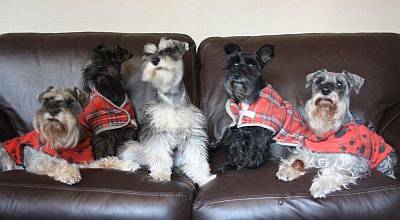 Count yourself lucky to be the recipient of one of Lyn's schnauzers. Our puppies are registered with KUSA. Breeding restrictions apply. 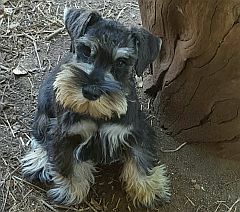 We microchip our miniature schnauzer puppies.